WILLEMSTAD- The preparations for the Curacao Pride 2018 are in full swing! This year is already the sixth edition of the annual event. For the first time, the organization of the Curacao Pride has decided to accommodate a number of its concept parties at various partners. During the former editions, the parties were mainly held at the grounds of the Floris Suite Hotel. 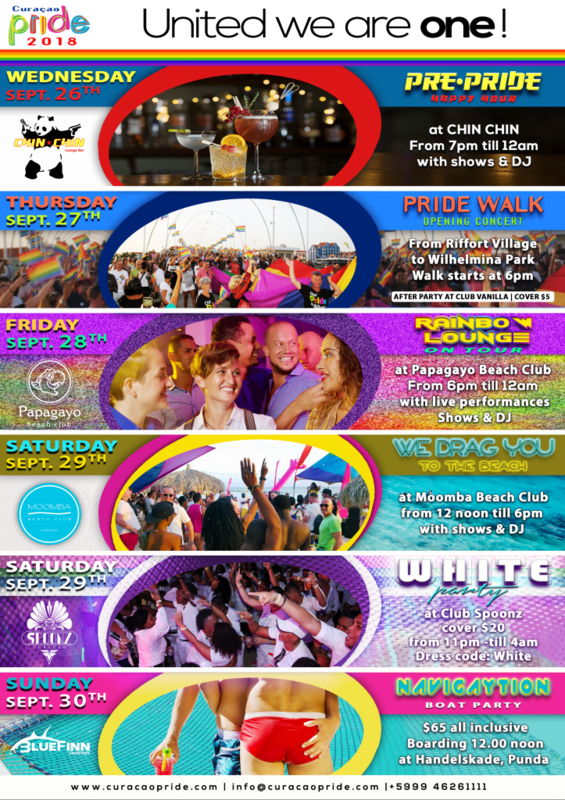 The Curacao Pride parties will be held at Chin Chin Lounge Bar, Papagayo Beach Club, Moomba Beach Club, Spoonz and Blue Finn Charters. "We are pleased to see that there is increasing acceptance about homosexuality and the celebration of the Pride event on the island. Organizing the parties at several locations on the island has been our goal from the beginning and is now actually happening. Over the years we have built the Curacao Pride to be also a regular event for guests from abroad. We see many returning guests from the Netherlands, Germany, North America, Florida and South America, but also from the surrounding Caribbean islands. Many of these islands are not organizing Pride events or even have an anti-gay regime. Because of this we are extra proud that we are able to celebrate a Pride on Curacao. The Curacao Pride 2017 was even opened by Prime Minister Eugene Rhuggenaath. " Floris Suite Hotel has nice promotions and special prizes during the Curacao Pride period to stimulate tourism to the island. The Curacao Pride organization also calls out to other hospitality establishments to do the same. Their aim is to make Curacao Pride a real island event in which everyone benefits. The slogan this year is, therefore “United We Are One”. The Curacao Pride 2018 traditionally takes place in the last week of September. The complete program can be found on www.curacaopride.com or on the Facebook page www.facebook.com/curacaopride.